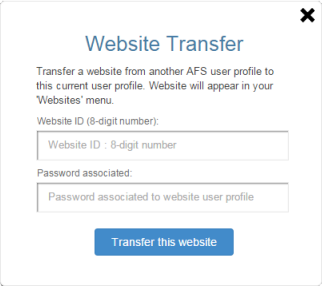 «Website Transfer» is a useful option if you have multiple users profiles registered under different email addresses. This feature allows you to move a website ID from an user profile to another user profile. 1 - Select the option “Transfer Website” in the “Account” drop down menu. Note: This option is also available in the “website(s)” drop down menu. 2 - The “Transfer Website” form appears. 3 - Type the website ID (00900001) into the field labeled “Website ID”. 4 - Type the user profile password (pass456) into the field labeled “password associated”. The “bigsite.com” will now be attached to your first user profile. It appears in the “websites” drop down menu and in the “manage websites” page. There is no website attached.